It’s been difficult finding information on the “night raiders” gummed labels and stickers that I posted about previously. 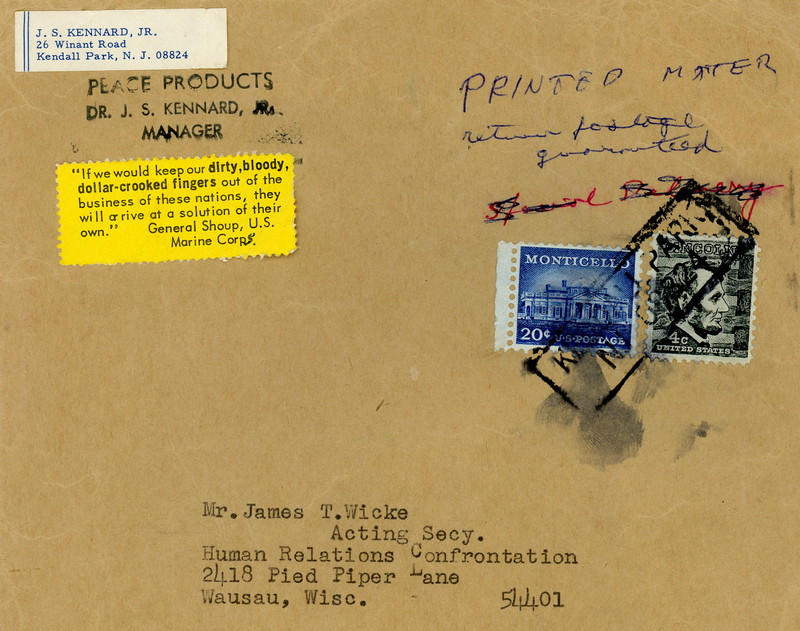 Google searches for the sender of the envelope—J S Kennard—and text on the stickers—FANSHEN, FANSHAN, Peace Products, night raiders, and Vietnam War—have yielded next to nothing. I’ve only got one lead with FANSHEN, but need to do some more research before I can post anything. Today, however, on ancestry.com, I found out that a James T. Wicke, formerly from Wausau, Wisconsin, died at age 51 on January 16, 1999, in Chicago. Survivors included a son, Guy F. Wicke, who is now a Chicago-based comedian and works in marketing and public relations for the theater community. His company is called Wicke International, and he writes on his Web site that the name was a joyous nod to his late father, James T. Wicke’s, sense of humor. Dad ran two apartment buildings, and as a property manager created letterhead, cards, and pens to look like a global corporation, bringing a playful irony to his business. I emailed Guy Wicke to see if he can help fill me in on the stickers. Stay tuned!